When you drag clips around in the Media Composer timeline, the Composer window adjusts to show you what you’re doing. Instead of displaying the usual side-by-side images, it shows four frames: the A and B sides of the two cuts you’re adjusting as you drag. In some cases, this is super-slick and allows you to make quick and precise changes. But the fact that those video images have to update can slow down the drag, especially as it begins, and that can make editing this way feel like you’re moving through molasses. There used to be a way to suppress the four-frame display on a case by case basis. You held down a modifier key while you dragged and the images wouldn’t appear. 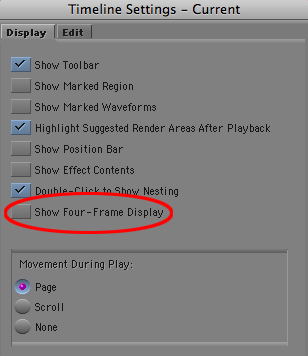 We seem to have lost that in Version 5, but you can still turn off the four-frame display with a setting. You’ll find it in timeline settings. Deselect “Show Four-Frame Display” and you may find that timeline dragging is a lot more responsive. This entry was posted on September 6, 2010 at 6:03 pm and is filed under Avid, Avid Technical Tips. You can subscribe via RSS 2.0 feed to this post's comments. You can comment below, or link to this permanent URL from your own site. Reblogged this on Uttarakhand Cinema.